The inspiration behind Partners for Sustainable Learning has been developing for many years. Our founder, Diann Grimm, has worked in education with children, parents and teachers for over 30 years. In 2000, she spent several weeks as a volunteer at a school for children with disabilities in Ecuador. This experience introduced her to the world of international volunteering and prompted her to spend each summer in a faraway country immersed in a classroom, an orphanage and even looking for elusive river otters in Bolivia! ﻿As Diann prepared for her volunteering experiences, she solicited donations of pens, paper, markers, books and learning toys from friends, family and colleagues. She experienced firsthand the bleak classrooms and lack of teaching materials in developing countries such as Peru, Honduras, Ghana, Guatemala, Nepal and others. On one of her last trips, Diann realized that the donations were not always so helpful. After the markers dried up, the last pieces of coloring paper were used and the plastic toys were broken, the teachers in these schools were right back where they started before they received the “generous gifts.” This approach did not yield long term benefits as it was not “sustainable.” Instructional materials needed to be durable and easily available so educators could replace them if lost or broken. Diann then realized that effective learning materials could be constructed from readily available﻿ natural objects, recycled items or purchased at local markets. She created an early learning curriculum based on these "sustainable learning materials." The curriculum emphasizes a whole child approach that promotes learning in the domains of mind, body and heart. 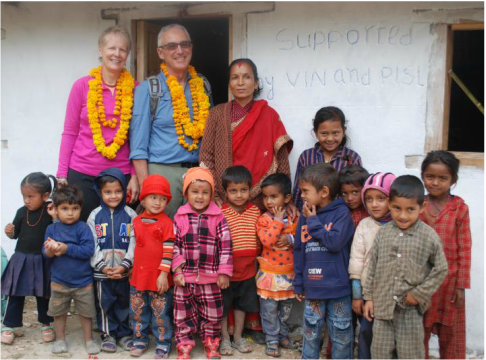 You can become part of the story by supporting early childhood education in Nepal. A young girl in Nepal learns about color, size and shape using a flannel board donated by PiSL.